My lovely weekend in London peaked as we entered the out-of-this-world Kensington Palace. I felt like the queen walking down the Gardens' cobblestone path to the famous Orangery restaurant for our lunch reservation. We were so enthralled by the airy white architecture and surrounding gardens, that we did not even need to order much off the menu. The setting in itself made this meal one to remember. A bottle of Pinot Grigio was refreshing. We agreed it was five o'clock somewhere! Back to the menu. Mel and I each got the salmon tartare, which was equally beautiful and tasteful. The molded dish began with raw salmon, then a layer of creamed herbs, then a layer of light greens and shaved cucumber, then a drizzle of vinaigrette. It satisfied my craving for Japanese-style tartare, but the English twist of herbs and cheese made me love each bite even more. Hannah ordered the gazpacho with goat cheese toast. Molly loved her heirloom tomato and mozzarella salad, which put the typical American caprese to shame. We felt like Royals, and we even SAW Royals driven into Kensington Palace on our way out. Yep, we're convinced it was William and Kate. 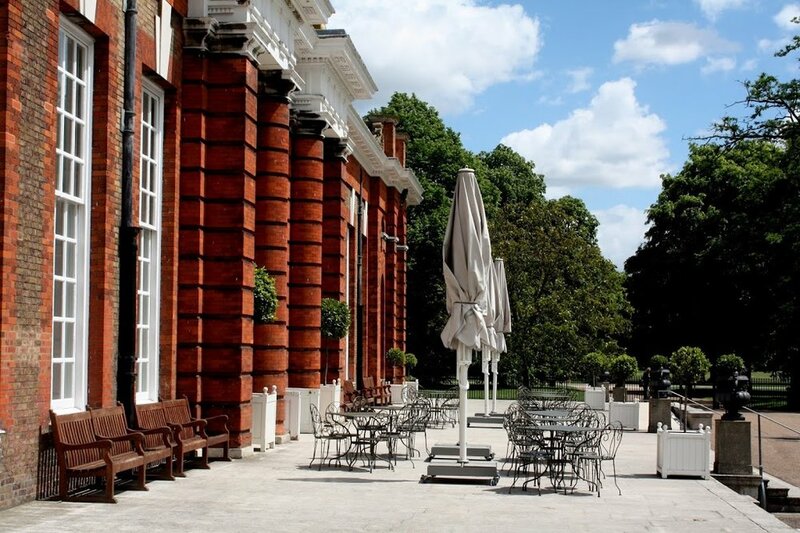 If you're feeling sophisticated and craving a royally wonderful meal, make a reservation in advance and walk through the Kensington Gardens to the Orangery. There's nothing quite like it. Notting Hill, the location of our dainty bed and breakfast, houses the well-known Portobello Market on weekend mornings with vendors and storefronts galore for every type of shopper. The four of us spent Saturday morning roaming and admiring the clothing, china and antiques, and pastel buildings, but one little bakery caught our eye: Gail's. The sign outside reads: "Grab a lovely warming breakfast inside." How can you pass that up? So on Sunday morning, we ventured back to Gail's and beat the crowd at around 9:30 am. I was in disbelief at the eye-opening selection but very content with our choices. Molly's "dense" scone was delicious. Served with butter and jam, of course. I tried the organic Greek yogurt with homemade granola and blackberry compote. The granola, which I should've bought more of, had whole, sugared almonds and macadamia nuts with fruit and oat clusters. I could taste the honey in every spoonful. Then, I realized I hadn't had eggs since Memphis, which is actually a VERY long time for an egg-lover like me. I went back up and ordered a side of two fried eggs. Doesn't the sprig of rosemary make it cute? To drink, I had the cappuccino, Mel had the macchiato, Hannah had the latte, and Molly had fresh squeezed orange juice. All were presented beautifully - Hannah's foam was shaped in a heart. Gail's provided a delightful final brunch in London. I wanted to stay for lunch to try one of these smoked salmon/avocado guys! Next time, I'm positive I will. Fortnum & Mason takes more than one ingredient to collectively describe its atmosphere and utter perfection. I'll do my best to share the wonders of this five-story specialty food store and cafe hub on Piccadilly. The first ingredient is Alice in Wonderland. The winding center staircase made me feel as if I fell down a tree myself and ended up in a pastel paradise! Even the greenery on the storefront awning was shaped into iconic hats and tea pots. The cups, saucers and cutlery were the brightest of colors, and the silver china tea pots were stunning. The second ingredient is royalty. We felt as if we had stepped into our palace of indulgent sweets and confectionaries. The title of our drink at Afternoon Tea was not just "tea," but ROYAL tea! Plus, our little waiter treated us with the utmost kindness, which of course added much to the experience. The third ingredient is attention detail. Our scones and mini ice cream cakes - dark chocolate, mandarin orange and raspberry - were decorated with colorful flourishes, along with the overall store's decor. Crystal handeliers, gold lining and an inventory of thousands of chocolates or olive oils or liqueurs added to the overall store's expertise. How incredible are these cookies? And the last ingredient? It's a secret, like in every good quality recipe...but I will tell you that I couldn't stop smiling after every sip of tea, every taste of jam, and every food gadget or apron or cookbook I laid my eyes on. I hope you too can experience the magic of F&M. Well, our marathon of summer European travels began with a sprint. Hannah and I were advised to arrive at the train station "a few minutes" before the departure, considering the station doesn't assign trains until minutes beforehand. Well...that was the wrong advice. We showed up at 7:30 for the 7:43 train, unaware of the fact that we had to fill out a customs form, go through border security, screen our bags, and run to the train down three sets of escalators. To be honest, I don't really remember anything after 7:30 except for jumping onto the 18th car of the train as the doors were closing. Hannah and I had seats in the third car. We stumbled down aisle by aisle, car by car, panting and laughing at the miracle we had just witnessed. Our passports served as fans for the first twenty minutes of the Chunnel once we found our seats. Newest lesson learned: arrive at the train station at least thirty minutes beforehand. ...But don't worry, we made it to London! And our reunion with Mel and Molly at the adorable Dawson Place Bed & Breakfast in Notting Hill was exciting as ever! Our first stop was an adorable, French style bistro (figures) around the corner from our bed and breakfast, called Côte Brasserie. The staff was friendly, the eclectic menu wasn't too pricey, and the most adorable old Scottish man sat to the right of us and managed to tell his entire life story in one 10-minute conversation. He and Mel are dating now. After a round of beer, we ordered ratatouille, asparagus and arugula risotto, and Mel had a delicious piece of seabass. Every dish was portioned well. The ratatouille, which I'm used to eating as a vegetable stack with tomatoes, was served like a bruschetta. The warm vegetables melted pieces of goat cheese and sat on top of arugula and one toasted slice of bread. It was heavenly. The risotto was rich, but the green summer vegetables and heaping bunch of arugula on top made it feel almost like a salad! We had an enjoyable first meal in the city; in fact, we were wishing that we could become regulars at the place like the old Scottish man. Too bad we were only staying for 48 hours! - Harrods and Harvey Nichols. Duh. - Fortnum & Mason. The specialty food store and afternoon tea paradise deserves its own post, so here it is. - Portobello Market in Notting Hill and a fabulous breakfast at Gail's. Look out for that post as well. - Dinner at J Sheekey with my beautiful friend Alexandra from London, who spent her gap year at my high school in Memphis...and whom I have not seen in three years! - A lobster and summer vegetable salad at J Sheekey...to die for, people. - A run-in with the Royals at Kensington Palace...we're still trying to figure out who was in each limo! While the final few minutes in London provided only a small glimpse of my enjoyment in the city, I took my last 1.83 pounds to a bakery in the St. Pancras station (since we decided to arrive an hour in advance this time!). I didn't want to leave England with any cash; pounds in my wallet would unfortunately be useless. The bakery did not have any items under 2 pounds, but the sweet man behind the counter gave me his favorite pastry - an almond croissant - for my 1.83. It was so kind and left a sweet taste in my mouth of a simply wonderful weekend. Be on the lookout for some mouth-watering caramelized critiques. Cheerio, for now!